1. 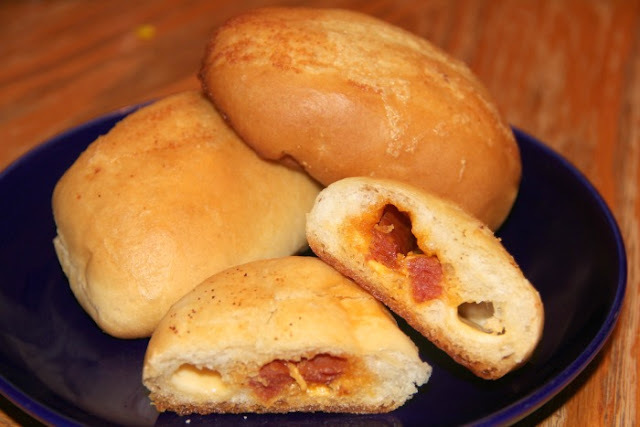 Start by making your roll dough. In a large bowl, dissolve the sugar in the warm water and stir blend. Add the yeast, stir, and allow to proof for 15 minutes. 2. Next add the salt and oil and stir. Finally begin to add the flour 1 cup at a time folding it in as you go, or if you like to cheat like me, utilize the dough hook on your kitchen aid mixer. I let my dough hook do the kneading for 5 minutes. 3. Remove the dough and place it in an oiled bowl; cover with a warm, damp towel and set it somewhere to rise for 1 hour. 4. While your dough is rising, preheat your oven to 350 degrees. 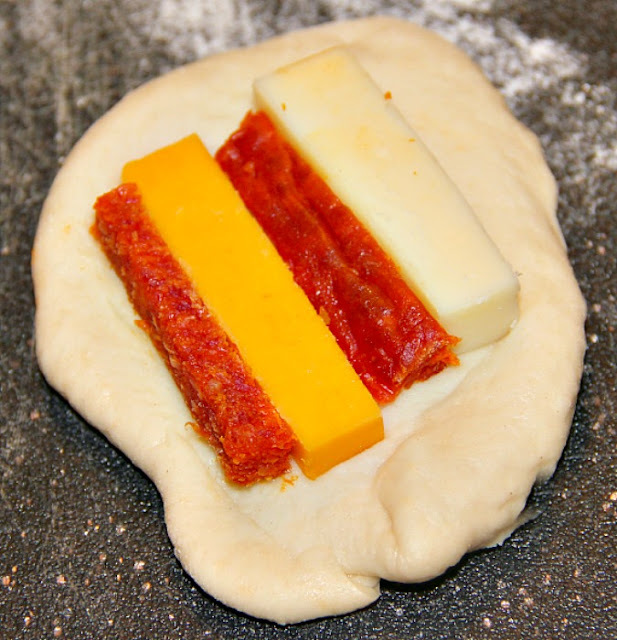 Take your pepperoni stick as well as your blocks of cheese and cut them into approximately 3" strips (pictured below). Set them aside until your dough has finished rising. 6. Close up the rolls and pinch them shut, placing them on an ungreased baking sheet seem side down. Cover with a warm damp towel and allow them to rise for another 30 minutes. 7. Melt the butter in a small dish and stir in garlic powder. Using a pastry brush, brush the top of each roll with the garlic butter. 8. 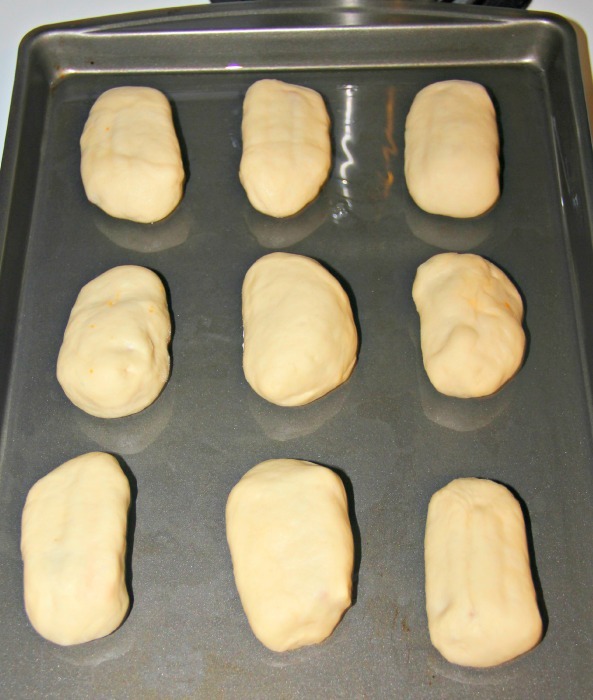 Bake in preheated oven for 20-25 minutes. Serve them warm or eat them cold. 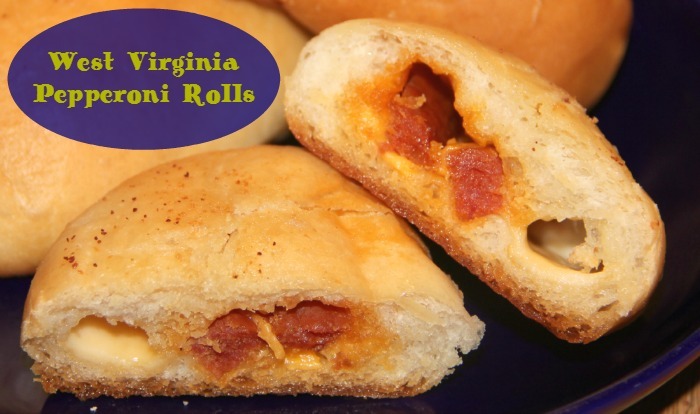 When my kids are in school, they love it when I pack these in their lunches! **Our Southern Style Tip** There's no Break Maker machine at my house - I use my Kitchen Aid Mixer for all my mixing and kneading in all of my bread recipes. Oooh yummo!! These sound amazing!! I bet my son would just love them too!! Maybe just ham in his to replace the pepperoni?!?! Can't wait to try them!! yummers, will have to make this for my kids, they love pizza! This looks sooo good! Can't wait to try!